Shelby Dade Foote (1916-2005) was a noted southern writer and historian who lived most of his adult life in Memphis, Tennessee. His home was on East Parkway and Rhodes is located less than two miles away on North Parkway. When the collection was acquired by the College in 2010, it moved from one Parkway to another. This exhibit highlights events in Foote's life and some of the items in the collection which is composed of diaries, manuscripts, research notes, letters, and photographs from the 1930s to the early 2000s. A finding aid to the print collection is available in the College Archives. 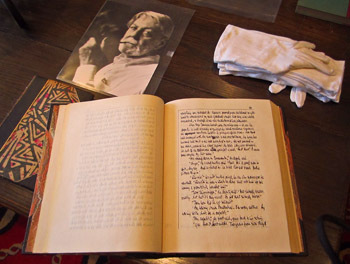 The Shelby Dade Foote, Jr. Collection is available to researchers through the generosity of Steven R. and Riea Lainoff.